This London Fog drink is an easy & healthy recipe you can make at home. 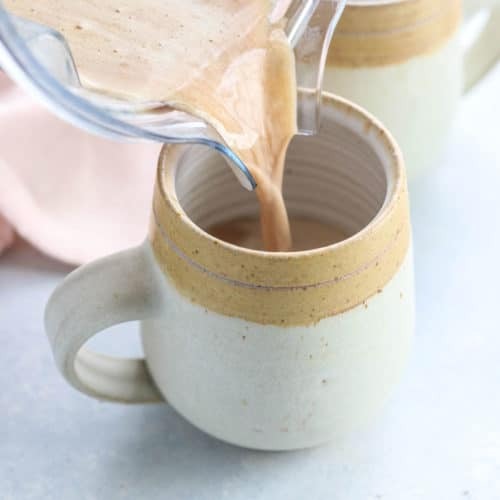 This Earl Grey tea latte is dairy-free and naturally-sweetened! Prepare the Earl Grey tea by pouring 8 to 12 ounces of boiling water over the tea bags in a mug. I like to use 2 tea bags for an extra-strong tea flavor, but you can use just 1 bag if you prefer a more mild drink. Cover the mug with a tea saucer, to lock in the heat. After the tea has brewed for 3 to 5 minutes, remove the tea bags and pour the hot tea into a blender. Add in the dates, almond butter, and vanilla, and blend until very smooth and creamy. Serve the hot tea latte right away and enjoy.